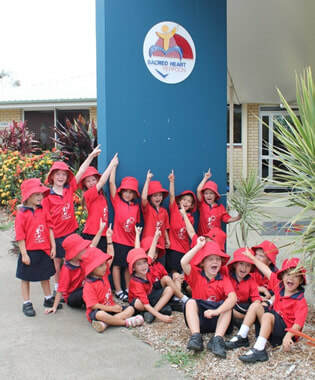 Sacred Heart Primary School is located on the Capricorn Coast. The Presentation Sisters established Sacred Heart School in 1958 with 41 students enrolled in Years 1 and 2. The school was on a limited site beside the Catholic Church in John Street, Yeppoon. Sr Pius Stubberfield P.B.V.M. was the first Principal and the Parish Priest at that time was Fr M O'Connell. The separate primary school grew out of St Ursula's College. The Presentation Sisters ceased to provide principals to Sacred Heart School in 1977 and since then, have had a limited presence. The last religious member of staff was in 1993. As enrolment continued to increase and, based on recommendations made by a committee formed to investigate the future needs of Catholic education on the Capricorn Coast, a decision to relocate the school to a new site at Lammermoor Beach was taken in 1987. The school opened at Lammermoor Beach in 1991. Enrolment numbers at Sacred Heart peaked in 2008 with an enrolment of 615 students. In 2009, a new Catholic Primary School, St Benedict's, was opened to the north of Yeppoon. The projected enrolment number for 2016 is 455. Since 1991 the school has continued to expand with new classrooms, extensions to the administration building and library and an additional car park in Bottlebrush Drive. Sacred Heart School has excellent resources with a court-size covered area, full size oval, modern play equipment and a sacred site and labyrinth. The school is located close to the Sacred Heart Church. Lammermoor Beach is within walking distance and, within the school grounds, there is a paperbark swamp which includes a large area of remnant vegetation.